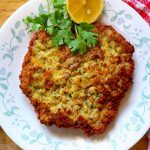 Keto Wiener Schnitzel - Headbanger's Kitchen - Keto All The Way! Inspiration for this Keto Wiener Schnitzel struck me while I was watching Masterchef Australia. One of the contestants Gina Ottaway made a Schnitzel for one of the challenges and it inspired me to make today’s recipe. I have to admit that while I have eaten a schnitzel or two in my life, I’ve ever eaten it in Austria or Germany (where it’s often thought to be from). So my experience with the schnitzel has largely been in India. I will admit that most of what I’ve eaten hasn’t quite hit the spot so I was determined to make this the best one I’ve eaten. Even though I have a recipe for Keto breadcrumbs, I decided to use my coconut flour mug bread to make a Parmesan and parsley bread crumb. I also managed to get some veal for this recipe so it worked out perfectly. Anyway enough jibber jabber. Let’s cook. Now let’s talk about the cow in the room. Veal. It’s a calf i.e baby cow. In India of course I’m sure it’s baby water buffalo. I feel we must understand what we eat and why it exists. I can imagine a lot of people being squeamish about eating a baby animal but you must accept the reality of the world we live in. Veal exists because there is no use for male calves. If you drink milk, you are the reason veal exists because cows are needed for milk and meat. Growing a baby male calf is not needed and a waste of the farmers resources and hence veal exists. Now this isn’t some triad to get you to stop eating meat but it’s more for you to know, understand what goes into the food you eat. Having said that you can just use chicken or pork for this dish as well. These macros include the breadcrumbs. My entire mug bread made enough crumbs to coat 2 veal cutlets. 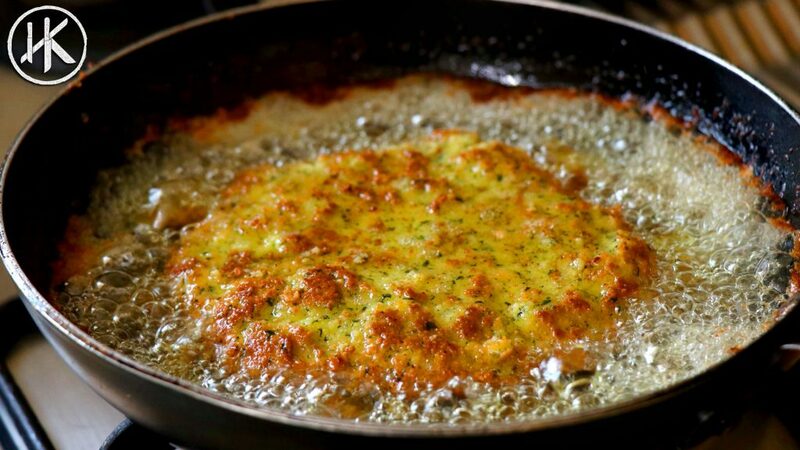 As mentioned in the recipe the cutlets are about 150grams each and are beaten quite thin. As thin as possible so it cooks quickly and the crumbs will not burn from being cooked too long. I’ve also included 1 extra tablespoon of oil in the macros from the possibility of the oil soaked in while cooking. It’s very hard to know actually how much additional oil ends up being consumed so I take a very generic 1 tablespoon for the entire recipe. Mix the coconut flour, parmesan, parsley, garlic powder, salt and baking powder in a bowl. Then add the egg, olive oil and whipping cream and give it all a good mix. Microwave the mixture for 2-3 minutes till it's fully cooked. Remove from the bowl and set aside to cool. I would recommend drying it out in the oven for about 10 minutes at the lowest temperature. Once it's properly cooled down then blitz it in the food processor to form a breadcrumb. 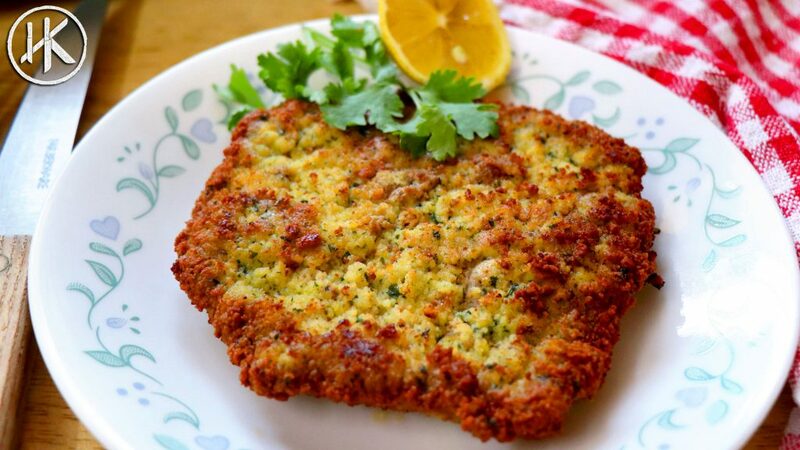 Take the veal meat and using cling flip and a meat mallet bash it to form a thin cutlet. Make sure it's extremely thin as it will contract and get thicker when it cooks. Season the veal with salt and pepper on each side. You can also use any other seasoning you like. However since it's a very thin cutlet be careful on to over season it. Season very lightly. You can either pan fry, shallow fry or deep fry these. You want to do it at a medium heat so as to get a nice colour on the breadcrumbs but not burn them. The meat because lean veal and beaten quite thin will cook very quickly. So about 3-4 minutes on each side should be enough. Serve with a slice of lemon. Enjoy with a nice refreshing salad on the side. You can also make the Keto bread with almond flour and you will need about 30 grams of almond flour for the same recipe as above. You could also possible use pork rinds. You can grind the pork rinds and mix it with the grated Parmesan and parsley. Can I use mutton to make this recipe? Will it come out good? No I would not recommend mutton because mutton is very tough and needs to be pressure cooked. You can use beef (filet steak cut) or you can use chicken breast. First time making the coconut flour mug bread and I really liked the way it tasted but it was a little dry. I didnt have whipping cream so I repleaced it with cream cheese, maybe thay is the reason for the dryness? or is it normal? Yes that’s probably it and also if you are eating the bread as it is microwave it for 90 seconds actually. I microwaved it for 2 1/1 minutes because I wanted to dry it out for the breadcrumbs. So actually I think it was just the cooking time in your case, not the cream cheese. Small question. can I make a bunch with this geat recipe and freeze it? Chef I just started Keto and I made this dish tonite. It had so much flavor.I love watching your videos and you are a kick to watch. I especially love how you enjoy what you have made. Dear chef, I made it with diced porcrinds instead of coconutflour. Not sure how it works out with the meat. the taste is just fantastic..